Nutrapro Virgin Cod Liver Oil is made from wild Norwegian Arctic cod from the pure sea water. The fish is processed within 24 hours in effective and gentle manner. The oil is separated from fresh cod fish livers using cold pressed & advanced purifying technologies without the use of chemicals, to produce its exceptional fresh quality. This product is regularly tested (using AOAC international protocols) for freshness, potency and purity by an independent, FDA-registered laboratory and has been determined to be fresh, fully-potent and free of detectable levels of mercury, cadmium, lead, PCB’s and 28 other contaminants. The liver of Arctic cod has a high concentration of vitamin D. Vitamin D increases the uptake of calcium in the body and is a prerequisite for strong bones and teeth. 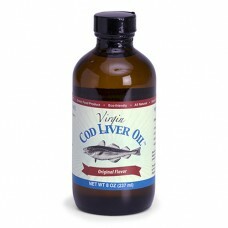 Vitamin A in Virgin Cod Liver Oil helps with proper vision and immune functions. Virgin Cod Liver Oil is naturally rich in the important Omega-3 fatty acid DHA & EPA. The DHA is vital to the optimal development and maintenance of the brain, sight and nervous system. The EPA has positive affects on coronary heart disease, high triglycerides (fats in the blood), high blood pressure, and inflammation. These fatty acids also reduce pain and swelling. How is it Different from Other Brands? 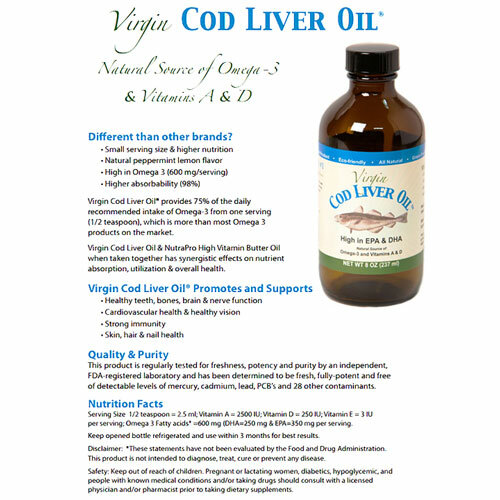 Virgin Cod Liver Oil provides 75% of the daily recommended intake of Omega-3 from one serving (1/2 teaspoon), which is more than most Omega 3 products on the market.The oil is separated from fresh cod fish livers using cold pressed & advanced purifying technologies without the use of chemicals. Many people take it for Teeth, Bone, Joint Health, A Strong Immune System, Cardiovascular Health, Vision, Brain & Nerve Function and Skin, Hair & Nail Health. "I purchased this directly from the company. They were very helpful and answered my many questions about this and other products of theirs. The price is actually quite reasonable for cod liver oil that is minimally processed. It's actually really difficult to find cod liver oil that hasn't been tinkered with. Almost all of them either have the vitamins removed and then added back in smaller amounts than exist in the original oil or, worse, have the vitamins removed and then have synthetic forms of the vitamins added back in. The only other cod liver oil in the US that leaves the oil in the state in which it's extracted is Green Pastures. And while Green Pastures' product is more concentrated nutritionally, it's extracted through fermentation, which gives it a really funky taste that can be hard to take. This product is cheaper by volume but probably works out to a similar cost if you go by vitamin content, but I can take it without having to brace myself and chase it down with something." "I have tried all of the cod liver oils on the market- including the popular fermented cod liver oil by GP. I had been previously using the Green Pasture's cod liver oil, but discovered that it is not suitable for my specific body chemistry through the medium of muscle testing as well as my physical well-being after taking the product. I needed a replacement in order to keep my skin healthy. I decided to give it a go- and I am oh so glad that I made the purchase." Nutrapro Virgin Cod Liver Oil is made from wild Norwegian Arctic cod from the pure sea water.&nb..
NutraPro High Vitamin Organic Butter Oil is a product of fresh non-homogenized milk from co..